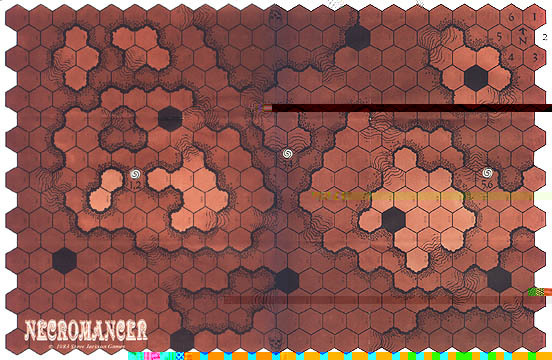 This is a variant of Ogre played on a Necromancer map. The uneven terrain is considered to be a badlands, with the darkest colored areas representing the lowest elevations and the lightest ones the highest. The thick lines on the map represent cliffs or steep slopes, differences in elevation of about 20 meters. Slope hexes are breaks in the cliff sides. The black outcroppings are deep craters which cannot be entered. 2.1 Infantry. Infantry units can move "downhill" to a lower elevation without penalty, but crossing an elevation line "uphill" costs 2 MP. Infantry units treat slope hexes as clear terrain. 2.2 Armor units, hovercraft, and other units. These cannot move "uphill" through an elevation line, but they can enter slope hexes at a cost of 2 MP. If a unit moves through a line to a lower elevation ("downhill," cost 1 MP), that unit immediately undergoes a 1-point attack – from the fall, of course. An "NE" result means the unit is unaffected (it found a scalable portion of the slope), but a "D" result means the unit must stop in the lower hex. It is not disabled, but it cannot attack or move further that turn; on the next turn it moves and fires normally. An "X" result destroys the unit. 2.3 Ogres. Ogres cannot move uphill except in slope hexes (cost 2 MP). If an Ogre moves downhill (cost 1 MP), roll two dice; the Ogre loses this many tread units. It may continue to move if it has movement points left. If the loss of treads reduces the Ogre to a lower movement class, it may only continue moving if it has points left in that lower class. 3.1 "Plunging" fire. If you are adjacent to a cliff (elevation line), an enemy unit is below you, and it's one or two hexes away, you may "fire down" at the enemy at +1 to your die roll. There is no bonus or penalty for "firing up," since this is standard indirect fire. If a unit(s) "firing down" combines its attack with other friendly units, the whole attack receives the +1 plunging bonus. Bonuses are not cumulative; no single attack ever gets more than +1. 3.2 Creating slopes. If you're using Shockwave "structure point" rules, units may fire at cliff faces and turn them into slopes that can be climbed. Consider each elevation-line hexside to have 100 SP; when it accumulates this much damage, slope hexes are formed on both sides of the line (units in those hexes are unaffected). Use dummy counters to indicate the slope hexes. If you don't have Shockwave [or Ogre Miniatures], units cannot create slopes. 4.1 Infantry overruns over Cliffs. If you're using G.E.V. rules for overrun attacks, infantry units which make overrun attacks over a cliffside (in either direction) get a certain advantage due to surprise. Against any defending units except Ogres and infantry, attacking infantry get the first attack (an exception to the usual rule of defenders firing first). The defenders then get to fire in reply, and thereafter the overrun proceeds normally. If the defending units include Ogres or infantry, those units (only) get their usual defensive fire against overrunning infantry before attackers can fire. 5.1 Set-up. The defending (Paneuropean) player (White) gets the following: 10 arrnor units, 16 strength points of infantry, two emplaced nuclear weapons (see special rules below), and a D0 Command Post in hex 0804. Defending units may be placed anywhere on the map, "covered" (each unit has another counter on top of if to hide it). The attacking (Combine) player (Black) gets 20 armor units and 14 strength points of infantry which enter from any hex(es) on the east edge of the map. The entry hex counts for movement. The attacker has the option of trading 15 armor units for an Ogre Mark III. The defender uncovers all his units after the anacker's first movement phase. The attacker does not have to commit all forces on Turn 1. 5.2 Special rules. The defender has a hidden route up the cliff to the Command Post. For defending (White) units only, consider that the hex boundary between 0804 and 0904 gives no terrain penalty for units crossing it. The two emplaced nukes may be hidden anywhere on the map before play begins in any hex west of the north-south line marked by the two skulls. They can both be placed in the same hex. At any time, the defender may detonate a nuke by remote control. All units in that hex and adjacent hexes (except Ogres) are destroyed; Ogre treads and each Ogre weapon undergo a 2-1 attack (divide treads into groups of 5 and attack each group individually). If the nuke is adjacent to an elevation line(s), the nuke hex and the hex across the line both become slope hexes. These hexes cannot be entered until one full turn after the nuke is detonated – rocks and dust are still falling. Detonating a nuke does not affect another nuke emplaced in the same hex. All defending units destroyed: complete Combine victory. Command Post destroyed and some attackers escape off east edge: Combine victory. CP destroyed and all attackers destroyed: marginal Combine victory. CP survives but some attackers escape off east edge: marginal Paneuropean victory. CP survives, attackers destroyed: Paneuropean victory. CP and 16 attack points of defense survive: complete Paneuropean victory.